Ofcom has opened seven investigations into Russia Today, in light of the Salisbury nerve agent attack which took place in March. The regulator will investigate "due impartiality of news and current affairs programmes" on the channel. A spokesperson for Ofcom said "we have observed a significant increase in the number of programmes that warrant investigation". It aims to announce the outcome of the investigations "as soon as possible". The statement added: "In relation to our fit and proper duty, we will consider all relevant new evidence, including the outcome of these investigations and the future conduct of the licensee." Ofcom also confirmed it was investigating "audience tweets" in The Alex Salmond Show, which, the regulator said, "we have provisionally found were not from audience members". In recent weeks, Russia Today's 24-hour news channel has been covering the nerve agent attack on Sergei Skripal and his daughter Yulia, which took place at their home in Salisbury on 4 March. 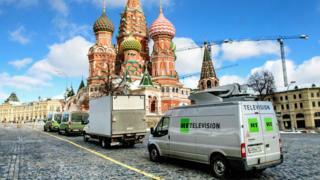 The channel's slogan is "Question More", and the network aims to provide its international audience with the Russian viewpoint on global events.